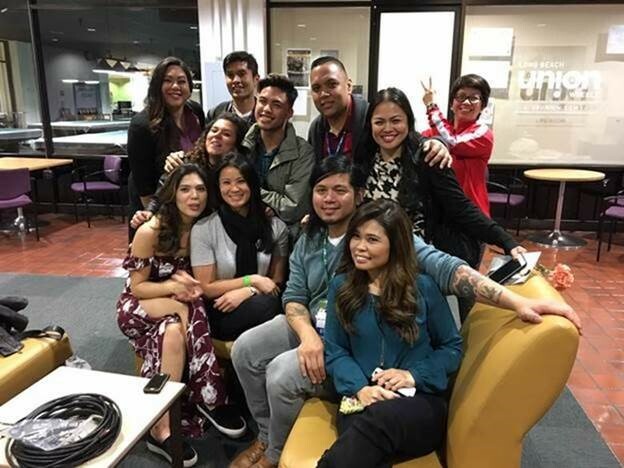 LONG BEACH, CA, February 20, 2017 – “I’m here to talk about my challenges that I had to overcome in the music industry being a triple minority: as a woman; being Filipino; and standing at 4 feet 11 inches.” This was the memorable introduction from MYX TV Host and Producer, and Co-Founder of mydiveo™ Roslynn Cobarrubias at the recent #TFCUTalks held at the 230-seater Beach Auditorium in the sprawling USC Long Beach Campus. It was an opening greeted by cheers and applause, followed by a brief but noticeable silence. A very brief stillness that for that moment, recognized the truths presented. They were real. The issues raised by Cobarrubias were real. There are certain molds and expectations that the Filipino American youth are expected to fit in and conform to, oftentimes creating tension and struggle within self when dreams go against templates. That was exactly what was addressed at #TFCUTalks with the theme: Breaking The Mold that featured singer, songwriter and YouTube sensation AJ Rafael, and winner of Food Network’s “Chopped” Chef Charleen Caabay, alongside Cobarrubias. Caabay, Cobarrubias and Rafael are Filipino American game changers who encountered struggles in their respective life journeys and overcame them by being true to themselves and by committing to a lot of hard work. They shared their incredible journeys to a very attentive and engaged audience at the talks presented by TFCU. Additionally, and perhaps more importantly, “U” also stands for Unity, which TFCU hopes to achieve. Pam Castillo, TFC Global Marketing Head, emphasizes that the vision of TFCU is to “connect Filipino American students to organize Filipino unity and pride on campus and beyond.” This ties in with the disposition of the young people of this generation to embrace acceptance, tolerance, and collaboration to achieve common goals. For the CSU Long Beach #TFCUTalks, the TFCU core team partnered with the CSULB chapters of Chi Rho Omicron or XPO and Kappa Psi Epsilon, and with Your Filipino Professionals Association (YFPA). There were also representatives from various Filipino-American campus organizations like Kababayan (UC Irvine), Pilipino American Coalition (CSULB), Barkada (Cal Poly Pomona), and Troy Philippines (USC). Taking advantage of real-life and real-world connections also provides TFCU the ability to embark on a Mentoring Program that they offer to college students. The program connects student organization or individuals with groups like Your Filipino Professionals Association (YFPA). These partnerships would pair student groups with mentors or coaches at the executive or managerial level to provide advice and counseling on projects and initiatives. There would also be one-on-one mentoring on career development in various areas, and guidance in transitioning from the confines of school to the workforce. It was almost four hours of animated engagement and give and take between the speakers and the audience. Adobo Nation Co-Host Ginger Conejero and DJ for the masses DJ Mia helped set the tone for the event with their masterful hosting and wicked spinning skills, respectively. While TFC is a brand already very familiar to the Filipino community, TFCU hopes to be there to make a difference for the second generation. TFCU aspires to play a very important part in inspiring and empowering the young ones to do what needs to be done in the community, while also fulfilling their dreams, without compromising who they are and what they stand for. All these while keeping that unique, second generation Filipino American flair, flavor, and energy. #TFCUTalks will be on the road throughout the whole year, reaching out to the young generation across the U.S. and Canada. #TFCUTalks will be going to universities, and in places where universities are not available, they will be at community centers. Watch for TFCU Talks in the following cities: San Diego, Seattle, Honolulu, Virginia Beach; and in New York and New Jersey.